The Afroasiatic languages, as they are distributed today. The term Afroasiatic Urheimat refers to the hypothetical place where speakers of the proto-Afroasiatic language lived in a single linguistic community, or complex of communities, before this original language dispersed geographically and divided into separate distinct languages. This speech area is known as the Urheimat ("original homeland" in German). Afroasiatic languages are today distributed in parts of Africa and Western Asia. The contemporary Afroasiatic languages are spoken in the Near East, North Africa, the Horn of Africa, and parts of the Sahara/Sahel. The various hypotheses for the Afroasiatic Urheimat are distributed throughout this territory; that is, it is generally assumed that proto-Afroasiatic was spoken in some region where Afroasiatic languages are still spoken today. However, there is argument as to which part of the contemporary Afroasiatic speech area corresponds with the original homeland. The earliest written evidence of an Afroasiatic language is an Ancient Egyptian inscription dated c. 3400 BC (5,400 years ago). Symbols on Gerzean pottery resembling Egyptian hieroglyphs date back to c. 4000 BC, suggesting a still earlier possible date. This gives us a minimum date for the age of Afroasiatic. However, Ancient Egyptian is highly divergent from proto-Afroasiatic (Trombetti 1905: 1–2), and considerable time must have elapsed in between them. Estimates of the date at which the proto-Afroasiatic language was spoken vary widely. They fall within a range between approximately 7,500 BC (9,500 years ago) and approximately 16,000 BC (18,000 years ago). According to Igor M. Diakonoff (1988: 33n), proto-Afroasiatic was spoken c. 10,000 BC. According to Christopher Ehret (2002: 35–36), proto-Afroasiatic was spoken c. 11,000 BC at the latest, and possibly as early as c. 16,000 BC. These dates are older than dates associated with most other protolanguages. Culturally this falls within the period of the Halfan culture which may have been proto-Afroasiatic. Supporters of a non-North or north East African origin for Afroasiatic are particularly common among those with a background in Semitic or Egyptological studies, or amongst archaeological proponents of the "farming/language dispersal hypothesis" according to which major language groups dispersed with early farming technology in the Neolithic. The leading linguistic proponent of this idea in recent times is Alexander Militarev. Arguments for and against this position depend upon the contested proposal that farming-related words can be reconstructed in Proto-Afroasiatic, with farming technology being widely thought to have spread from the Levant into North Africa and then the Horn of Africa. Militarev, who linked proto-Afroasiatic to the Levantine Natufian culture, that preceded the spread of farming technology, believes the language family to be about 10,000 years old. He wrote (Militarev 2002, p. 135) that the "Proto-Afrasian language, on the verge of a split into daughter languages", meaning, in his scenario, into "Cushitic, Omotic, Egyptian, Semitic and Chadic-Berber", "should be roughly dated to the ninth millennium BC". But an Asiatic origin need not be associated exclusively with the migration of agricultural populations: according to linguists, words for dog (an Asian domesticate) reconstruct to Proto-Afroasiatic as well as words for bow and arrow, which according to archaeologists spread rapidly across North Africa once they were introduced from the Near East i.e. Ounan points. A scenario that also fits the linguistic evidence is one in which Afroasiatic languages were introduced into Africa together with advanced hunting techniques before the subsequent introduction of agriculture. Christopher Ehret has proposed the western Red Sea coast from Eritrea to southeastern Egypt. While Ehret disputes Militarev's proposal that Proto-Afroasiatic shows signs of a common farming lexicon, he suggests that early Afroasiatic languages were involved in the even earlier development of intensive food collection in the areas of Ethiopia and Sudan. In other words, he proposes an even older age for Afroasiatic than Militarev, at least 15,000 years old and possibly older, and believes farming lexicon can only be reconstructed for branches of Afroasiatic. But, the appearance of linguistic terms such as dog, bow, and arrow in Proto-Afroasiatic makes a date earlier than 9,500 BC (coinciding with the end of the Younger Dryas) highly unlikely since dogs only appear at the earliest in the archaeological record after 12,000 BC in the Near East, and arrowheads only appear after 9,500 BC in Africa as a result of introduction from the Near East. Although at Lake Turkana microlithic arrowheads appear in southern Africa (71,000 BP) and with the Aterian culture (30,000 BP) suggests that arrowheads may have been an invention originating in Africa taken into the Near East by a pre-Afroasiatic late glacial migration. At the site of Nataruk in Turkana County, Kenya, obsidian bladelets found embedded in a skull and within the thoracic cavity of another skeleton, may suggest the use of stone-tipped arrows as weapons. After the end of the last glacial period, use of the bow seems to have spread to every inhabited continent, including the New World, except for Australia. However, these finds predate by far any proposed date for the evolution of Afroasiatic. In the next phase, unlike many other authors Ehret proposed an initial split between northern, southern and Omotic. The northern group includes Semitic, Egyptian and Berber (agreeing with others such as Diakonoff). He proposed that Chadic stems from Berber (some other authors group it with southern Afroasiatic languages such as Cushitic ones). Roger Blench has proposed Southwestern Ethiopia, in or around the Omo Valley. Compared to Militarev and Ehret he proposed a relatively young time-depth of approximately 7,500 years. Like Ehret he accepts that Omotic is Afroasiatic and sees the split of northern languages from Omotic as an important early development, but he did not group Egyptian or Chadic with any of these. 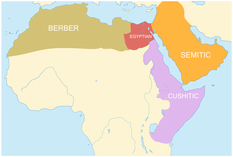 Another proposal is that Semitic is an offshoot of a northern family of Afroasiatic languages, including Berber, and possibly Egyptian. It then entered the Levant and was possibly spread by what Juris Zarins calls the Syro-Arabian nomadic pastoralism complex, spreading south along the shores of the Red Sea and northeast around the edge of the "Fertile Crescent". It is thought that Semitic speakers then crossed from South Arabia back into Eritrea. Igor Diakonoff proposed the Eastern Sahara region, specifically the southern fringe of the Sahara. Lionel Bender proposed the area near Khartoum, Sudan, at the confluence of the Blue Nile and White Nile. The details of his theory are widely cited but controversial, as it involves the proposal that Semitic originated in Ethiopia and crossed to Asia directly from there over the Red Sea. This could also potentially solidify Bender's argument, in that scholars today believe that there is a relationship between the Cushitic branch and the Chadic Branch; arguing that perhaps Chadic descends from Cushitic. Prior to Colonialism the Hausa peoples of present-day Niger, Nigeria, Burkina Faso, and Chad were not united as a single polity, but rather they existed as a sequence of seven city-states (situated between the Niger River and Lake Chad); each with their own Sovereign dynasty named after their shared common progenitor known as Bayajidda, who apparently came from the "East" to which a great deal of scholars attribute to being the "Middle East', though this is contested. Each City-State were their own entities but were intertwined through trade, language, religion, customs, and ethnic identity/relations; hence comprising a sizable cultural stock that had greater trade links with larger states and empires such as the Ghana Empire, Mali Empire, Kanem-Bornu Empires, etc. In current day southwestern Chad and northeastern Cameroon in the Lake Chad Basin, there are several ethnic groups that also speak an Afroasiatic language similar to the Hausas. They are known as respectively: the Biu–Mandara, Tumak, Nancere, Kera, Dangaléat, Mukulu, Sokoro, etc. Together with the Hausa, they collectively comprise the Chadic branch of the Afro-Asiatic family. There are also remnants of a civilization on the Cameroon side of Lake Chad that date back to at least the sixth Century BCE; which is suspected of being the remains of the late Sao civilisation, which scholars suspect as being the result of waves of Nubian migrations into West Africa (further substantiating the claims that 'Bayajidda' hence Hausas, came from the "East"). Sub-groups such as the Gamergu, Kanembu, Sokoro, and Musgum all claim relations to one another as well as descent from the Sao. For a basic introduction to population genetics, see Population genetics. The most commonly cited genetic marker in recent decades has been the Y chromosome, which is passed from father to son along paternal lines in un-mixed form, and therefore gives a relatively clear definition of one human line of descent from common ancestors. There is a high frequency of haplogroup E1b1b in select Afro-Asiatic speakers. Several branches of humanity's Y DNA family tree have been proposed as having an association with the spread of Afroasiatic languages. 1. Haplogroup E1b1b is thought to have originated in Horn of Africa. In general, Afroasiatic speaking populations have relatively high frequencies of this haplogroup, with the notable exception of Chadic speaking populations. Christopher Ehret and Shomarka Keita have suggested that the geography of the E1b1b lineage coincides with the distribution of Afroasiatic languages. 2. Haplogroup J1c3 (Y-DNA), formally known as "J1e", is actually a more common paternal lineage than E1b1b in most Semitic speaking populations, but this is associated with Middle Eastern origins and has apparently been spread from there after the original dispersion of Afroasiatic. 3. Haplogroup R1b1a (R-V88), and specifically its sub-clade R-V69, has a very strong relationship with Chadic speaking populations, who unlike other Afroasiatic speakers have low frequencies of Haplogroup E1b1b. The majority of R-V88 was found in northern and central Africa, in Chadic speaking populations. It is less common in neighbouring populations. The authors also found evidence of high concentration in Western Egypt and evidence that the closest related types of R1b are found in the Middle East in the Levant, and to a lesser extent southern Europe. They proposed that an Eastern Saharan origin for Chadic R1b would agree with linguistic theories such as those of Christopher Ehret, that Chadic and Berber form a related group within Afroasiatic, which originated in the area of the Sahara. R1b-V88 had probably entered Africa from Western Asia, via Egypt, and moved south along the Nile river and eventually crossing over to West Africa between 9,200 and 5,600 years ago. Semitic-speaking Assyrians were reported to have the Indo-European-linked haplogroup R-M269 at a frequency of 40%. In contrast to the evidence from paternally inherited Y DNA, a recent study has shown that a branch of mitochondrial haplogroup L3 links the maternal ancestry of Chadic speakers from the Sahel with Cushitic speakers from Horn of Africa. Other mitochondrial lineages that are associated with Afroasiatic include mitochondrial haplogroups M1 and haplogroup U6. Gonzalez et al. 2007 suggest that Afroasiatic speakers may have dispersed from Horn of Africa carrying the subclades M1a and U6a1. According to an autosomal DNA study by Hodgson et al. (2014), the Afroasiatic languages were likely spread across Africa and the Near East by an ancestral population(s) carrying a newly identified non-African genetic component, which the researchers dub the "Ethio-Somali". This Ethio-Somali component is today most common among Afroasiatic-speaking populations in the Horn of Africa. It is most closely related to the Maghrebi non-African genetic component, and is believed to have diverged from all other non-African ancestries at least 23,000 years ago. On this basis, the researchers suggest that the original Ethio-Somali carrying population(s) probably arrived in the pre-agricultural period from the Near East, having crossed over into northeastern Africa via the Sinai peninsula. The population then likely split into two branches, with one group heading westward toward the Maghreb and the other moving south into the Horn. A related hypothesis that associates the origin of the ancestors of Afroasiatic speakers as the result of a reflux population from Southwest Asia during the Late Palaeolithic was previously put forward by Daniel McCall. The Nostratic language family is a proposed macrofamily grouping together a number of language families including Indo-European, Uralic, Altaic, and even more controversially Afroasiatic. Following Pedersen, Illich-Svitych, and Dolgopolsky, most advocates of the theory have included Afroasiatic in Nostratic, though criticisms by Joseph Greenberg and others from the late 1980s onward suggested a reassessment of this position. Ilya Yabonovich and other linguists, in examining the differences between the various members of the Afroasiatic family have realised that all of the old etymologies for this group were inherently semitocentric. The differences between Chadic, Omotic, Cushitic and Semitic, were wider than those seen between any members of the Indo-European family and as wide as some of the differences seen within and between separate language families, for example, Indo-European and Altaic. Certainly the exclusion of Afroasiatic from the controversial Nostratic family has simplified matters of phonemics, not having to include the complex patterns seen in Afroasiatic languages. Allan Bomhard (1994) retains Afroasiatic within Nostratic, despite his admission that Proto–Afroasiatic is very different from the other members of the proposed linguistic Nostratic superfamily. As a result, he suggests it was probably the first language to have split from the Nostratic linguistic superfamily. Recently, however, a consensus has been emerging among proponents of the Nostratic hypothesis. Greenberg in fact basically agreed with the Nostratic concept, though he stressed a deep internal division between its northern 'tier' (his Eurasiatic) and a southern 'tier' (principally Afroasiatic and Dravidian). The American Nostraticist Bomhard considers Eurasiatic a branch of Nostratic alongside other branches: Afroasiatic, Elamo-Dravidian, and Kartvelian. Similarly, Georgiy Starostin (2002) arrives at a tripartite overall grouping: he considers Afroasiatic, Nostratic and Elamite to be roughly equidistant and more closely related to each other than to anything else. Sergei Starostin's school has now re-included Afroasiatic in a broadly defined Nostratic, while reserving the term Eurasiatic to designate the narrower subgrouping which comprises the rest of the macrofamily. Recent proposals thus differ mainly on the precise placement of Dravidian and Kartvelian. ^ Miller C, Doss M (1996-12-31). "Nubien, berbère et beja: notes sur trois langues vernaculaires non arabes de l'Égypte contemporaine" [Nubian, Berber and beja: notes on three non-Arabic vernacular languages of contemporary Egypt]. Égypte/Monde Arabe (in French) (27–28): 411–431. doi:10.4000/ema.1960. ISSN 1110-5097. ^ a b c Blench R (2006). Archaeology, Language, and the African Past. AltaMira Press. ISBN 978-0-7591-0466-2. ^ a b c Bender ML (1997). "Upside Down Afrasian". Afrikanistische Arbeitspapiere 50. pp. 19–34. ^ Militarev A (2005). "Once more about glottochronology and comparative method: the Omotic-Afrasian case, Аспекты компаративистики - 1 (Aspects of comparative linguistics - 1). FS S. Starostin." (PDF). Orientalia et Classica II. Moscow. pp. 339–408. ^ Mitchell L (March 1999). "Earliest Egyptian Glyphs". Archaeology Magazine. 52 (2). ^ Diamond J, Bellwood P (April 2003). "Farmers and their languages: the first expansions". Science. 300 (5619): 597–603. CiteSeerX 10.1.1.1013.4523. doi:10.1126/science.1078208. PMID 12714734. ^ Bellwood P, Renfrew C (2002). Examining the farming/language dispersal hypothesis. Cambridge: McDonald Institute for Archaeological Research. ^ Diakonoff I (1998). "The Earliest Semitic Society: Linguistic Data". Journal of Semitic Studies. 43 (2): 209–219. doi:10.1093/jss/43.2.209. ^ a b c Shirai N (2010). The Archaeology of the First Farmer-Herders in Egypt: New Insights into the Fayum Epipalaeolithic and Neolithic. Leiden University Press. ISBN 9789087280796. ^ Ehret C (1982). "On the antiquity of agriculture in Ethiopia". Journal of African History. ^ Ehret C (1995). Reconstructing Proto-Afroasiatic (Proto-Afrasian): Vowels, Tone, Consonants, and Vocabulary. University of California Press. ISBN 978-0-520-09799-5. ^ Ehret C (2002). The Civilizations of Africa: A History to 1800. James Currey Publishers. ISBN 978-0-85255-475-3. ^ Ehret C (2002). "Language Family Expansions: Broadening our Understandings of Cause from an African Perspective". In Bellwood P, Renfrew C (eds.). Examining the farming/language dispersal hypothesis. Cambridge: McDonald Institute for Archaeological Research. ^ Ehret C (May 10, 2013). CARTA: The Origins of Us-Relationships of Ancient African Languages. A Public Symposium (Television production). University of California Television. Event occurs at 27:42. ^ Clutton-Brock J (1995). "Origins of the dog: domestication and early history". In Serpell J (ed.). The domestic dog: its evolution, behaviour and interactions with people. Cambridge: Cambridge University Press. ISBN 978-0-521-41529-3. ^ Mirazón Lahr M, Rivera F, Power RK, Mounier A, Copsey B, Crivellaro F, Edung JE, Maillo Fernandez JM, Kiarie C, Lawrence J, Leakey A, Mbua E, Miller H, Muigai A, Mukhongo DM, Van Baelen A, Wood R, Schwenninger JL, Grün R, Achyuthan H, Wilshaw A, Foley RA (January 2016). "Inter-group violence among early Holocene hunter-gatherers of West Turkana, Kenya". Nature. 529 (7586): 394–8. doi:10.1038/nature16477. PMID 26791728. ^ Monroe MH. Aboriginal Weapons and Tools. The favoured weapon of the Aborigines was the spear and spear thrower. The fact that they never adopted the bow and arrow has been debated for a long time. During post-glacial times the bow and arrow were being used in every inhabited part of the world except Australia. A number of reasons for this have been put forward [...] Captain Cook saw the bow and arrow being used on an island close to the mainland at Cape York, as it was in the Torres Strait islands and New Guinea. But the Aborigines preferred the spear. ^ Zarins J (1990). "Early Pastoral Nomadism and the Settlement of Lower Mesopotamia". Bulletin of the American Schools of Oriental Research. 280: 31–65. doi:10.2307/1357309. JSTOR 1357309. ^ Kitchen A, Ehret C, Assefa S, Mulligan CJ (June 2009). "Bayesian phylogenetic analysis of Semitic languages identifies an Early Bronze Age origin of Semitic in the Near East". Proceedings of the Royal Society B: Biological Sciences. 276 (1668): 2703–2710. doi:10.1098/rspb.2009.0408. PMC 2839953. PMID 19403539. ^ a b Bernal M (1987). Black Athena: the Afroasiatic roots of classical civilization. Rutgers University Press. ISBN 978-0-8135-3655-2. ^ a b Keita SO (2008). "Geography, selected Afro-Asiatic families, and Y chromosome lineage variation". In Bengtson JD (ed.). In Hot Pursuit of Language in Prehistory. Amsterdam, Philadelphia: John Benjamins Publishing. ISBN 978-90-272-3252-6. ^ a b Lancaster A (2009). "Y Haplogroups, Archaeological Cultures and Language Families: a Review of the Multidisciplinary Comparisons using the case of E-M35" (PDF). Journal of Genetic Genealogy. 5 (1). ^ a b Fadhlaoui-Zid K, Haber M, Martínez-Cruz B, Zalloua P, Benammar Elgaaied A, Comas D (2013-11-27). "Genome-wide and paternal diversity reveal a recent origin of human populations in North Africa". PLOS One. 8 (11): e80293. doi:10.1371/journal.pone.0080293. PMC 3842387. PMID 24312208. ^ a b Fadhlaoui-Zid K, Martinez-Cruz B, Khodjet-el-khil H, Mendizabal I, Benammar-Elgaaied A, Comas D (October 2011). "Genetic structure of Tunisian ethnic groups revealed by paternal lineages". American Journal of Physical Anthropology. 146 (2): 271–80. doi:10.1002/ajpa.21581. PMID 21915847. ^ Semino O, Magri C, Benuzzi G, Lin AA, Al-Zahery N, Battaglia V, Maccioni L, Triantaphyllidis C, Shen P, Oefner PJ, Zhivotovsky LA, King R, Torroni A, Cavalli-Sforza LL, Underhill PA, Santachiara-Benerecetti AS (May 2004). "Origin, diffusion, and differentiation of Y-chromosome haplogroups E and J: inferences on the neolithization of Europe and later migratory events in the Mediterranean area". American Journal of Human Genetics. 74 (5): 1023–34. doi:10.1086/386295. PMC 1181965. PMID 15069642. ^ Cruciani F, La Fratta R, Santolamazza P, Sellitto D, Pascone R, Moral P, Watson E, Guida V, Colomb EB, Zaharova B, Lavinha J, Vona G, Aman R, Cali F, Akar N, Richards M, Torroni A, Novelletto A, Scozzari R (May 2004). "Phylogeographic analysis of haplogroup E3b (E-M215) y chromosomes reveals multiple migratory events within and out of Africa". American Journal of Human Genetics. 74 (5): 1014–22. doi:10.1086/386294. PMC 1181964. PMID 15042509. ^ Iacovacci G, D'Atanasio E, Marini O, Coppa A, Sellitto D, Trombetta B, Berti A, Cruciani F (March 2017). "Forensic data and microvariant sequence characterization of 27 Y-STR loci analyzed in four Eastern African countries". Forensic Science International. Genetics. 27: 123–131. doi:10.1016/j.fsigen.2016.12.015. PMID 28068531. ^ Gebremeskel, Eyoab I; Ibrahim, Muntaser E (December 2014). "Y-chromosome E haplogroups: their distribution and implication to the origin of Afro-Asiatic languages and pastoralism". European Journal of Human Genetics. 22 (12): 1387–1392. doi:10.1038/ejhg.2014.41. ISSN 1476-5438. PMC 4231410. PMID 24667790. ^ a b C.A., Plaster (2011-09-28). "Variation in Y chromosome, mitochondrial DNA and labels of identity on Ethiopia". discovery.ucl.ac.uk. Retrieved 2018-06-28. ^ Morling, Niels; Hernandez, Alexis; Børsting, Claus; Hallenberg, Charlotte; Sanchez, Juan J. (July 2005). "High frequencies of Y chromosome lineages characterized by E3b1, DYS19-11, DYS392-12 in Somali males". European Journal of Human Genetics. 13 (7): 856–866. doi:10.1038/sj.ejhg.5201390. ISSN 1476-5438. ^ Maciamo. "Eupedia". Eupedia. Retrieved 2019-02-26. ^ Chiaroni J, King RJ, Myres NM, Henn BM, Ducourneau A, Mitchell MJ, Boetsch G, Sheikha I, Lin AA, Nik-Ahd M, Ahmad J, Lattanzi F, Herrera RJ, Ibrahim ME, Brody A, Semino O, Kivisild T, Underhill PA (March 2010). "The emergence of Y-chromosome haplogroup J1e among Arabic-speaking populations". European Journal of Human Genetics. 18 (3): 348–53. doi:10.1038/ejhg.2009.166. PMC 2987219. PMID 19826455. ^ "(PDF) The emergence of Y-chromosome haplogroup J1e among Arabic-speaking populations | Academic Article". ResearchGate. Retrieved 2019-03-21. ^ "(PDF) Extended Y chromosome haplotypes resolve multiple and unique lineages of the Jewish priesthood". ResearchGate. Retrieved 2019-03-21. ^ Tofanelli, Sergio; Ferri, Gianmarco; Bulayeva, Kazima; Caciagli, Laura; Onofri, Valerio; Taglioli, Luca; Bulayev, Oleg; Boschi, Ilaria; Alù, Milena (November 2009). "J1-M267 Y lineage marks climate-driven pre-historical human displacements". European Journal of Human Genetics. 17 (11): 1520–1524. doi:10.1038/ejhg.2009.58. ISSN 1018-4813. PMC 2986692. PMID 19367321. ^ Plaster, C. A. (2011-09-28). Variation in Y chromosome, mitochondrial DNA and labels of identity on Ethiopia (Doctoral thesis). UCL (University College London). ^ a b c Cruciani F, Trombetta B, Sellitto D, Massaia A, Destro-Bisol G, Watson E, Beraud Colomb E, Dugoujon JM, Moral P, Scozzari R (July 2010). "Human Y chromosome haplogroup R-V88: a paternal genetic record of early mid Holocene trans-Saharan connections and the spread of Chadic languages". European Journal of Human Genetics. 18 (7): 800–7. doi:10.1038/ejhg.2009.231. PMC 2987365. PMID 20051990. ^ Klyosov, A. A. (2010a). Haplogroup R1b1 and its subclades in Asia. Proceedings of the Russian Academy of DNA Genealogy, 3, 1676–1695 (in Russian). ^ Cerný V, Fernandes V, Costa MD, Hájek M, Mulligan CJ, Pereira L (March 2009). "Migration of Chadic speaking pastoralists within Africa based on population structure of Chad Basin and phylogeography of mitochondrial L3f haplogroup". BMC Evolutionary Biology. 9: 63. doi:10.1186/1471-2148-9-63. PMC 2680838. PMID 19309521. ^ González AM, Larruga JM, Abu-Amero KK, Shi Y, Pestano J, Cabrera VM (July 2007). "Mitochondrial lineage M1 traces an early human backflow to Africa". BMC Genomics. 8: 223. doi:10.1186/1471-2164-8-223. PMC 1945034. PMID 17620140. ^ Hodgson JA, Mulligan CJ, Al-Meeri A, Raaum RL (June 2014). "Early back-to-Africa migration into the Horn of Africa". PLoS Genetics. 10 (6): e1004393. doi:10.1371/journal.pgen.1004393. PMC 4055572. PMID 24921250. ^ Bomhard A, Kerns J (1994). The Nostratic Macrofamily: A Study in Distant Linguistic Relationship. Walter de Gruyter. ^ Starostin G (2002). "On the genetic affiliation of the Elamite language" (PDF). Mother Tongue. 7: 147–17. ISSN 1087-0326. Diakonoff, Igor M. (1996). "Some reflections on the Afrasian linguistic macrofamily". Journal of Near Eastern Studies. 55 (4): 293. doi:10.1086/373865. Diakonoff, Igor M. (1998). "The earliest Semitic society: Linguistic data". Journal of Semitic Studies. 43 (2): 209. doi:10.1093/jss/43.2.209. Ehret, Christopher. 1997. Abstract of "The lessons of deep-time historical-comparative reconstruction in Afroasiatic: reflections on Reconstructing Proto-Afroasiatic: Vowels, Tone, Consonants, and Vocabulary (U.C. Press, 1995)", paper delivered at the Twenty-fifth Annual Meeting of the North American Conference on Afro-Asiatic Linguistics, held in Miami, Florida on March 21–23, 1997. Greenberg, Joseph H. (1950). "Studies in African linguistic classification: IV. Hamito-Semitic". Southwestern Journal of Anthropology. 6 (1): 47–63. doi:10.1086/soutjanth.6.1.3628690. JSTOR 3628690. Sands, Bonny (2009). "Africa's Linguistic Diversity". Language and Linguistics Compass. 3 (2): 559–580. doi:10.1111/j.1749-818x.2008.00124.x. NACAL The North American Conference on Afroasiatic Linguistics. This page was last edited on 1 April 2019, at 18:37 (UTC).